"Wouldn't it be smashing if Priscilla turned out to be on one of the branches of our family tree?" Gregory said with an admiring glance at Honey's golden hair. Uh-oh, thought Trixie.Brian had better watch out. Back in Sleepyside, Honey and Brian had always had a special interest in each other. Of course, Honey's so attractive that people take a special interest in her wherever we go, Trixie thought fondly. The ghost writer of this book is thought to be Owenita Harrah Sanderlin. Sleepyside, New York and England. When Honey inherits a necklace from a great-great aunt, Mrs Wheeler enlists the help of Trixie, Jim and Mart to research the necklace and the Hart family history in England. 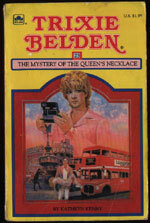 They set off to England under Miss Trask's care, and try to uncover the origins of the necklace. 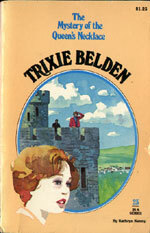 The four find themselves unwelcome in England and Trixie is certain they are the targets off a pickpocket. When a stranger saves Honey's life, he quickly becomes part of their lives as he and Miss Trask become quite close. Trixie is suspicious of him, but can she convince the others before it's too late and solve the mystery of the necklace? Gordie McDuff and Ferdie "grey cap" - were con artists and pickpockets who decided to aim for something bigger, Honey's necklace. Mart was letting his hair grow which made him look more like Trixie, and Brian is 17 (p. 16). Both Brian and Dan aren't able to go on the trip as they have to work to earn money for college, and Di is away with her parents. Honey has a great-great aunt Priscilla who lived in New England, and whom she never knew (p. 21). Mrs Wheeler's maiden name is Hart, and she believes she is related to Shakespeare (p. 24). The Bob-Whites, especially Trixie feel that they are resented and Jim tells her that English resented the American tourists after WWII, as the English were still on rations (p. 36). Later Trixie comments (a little arrogantly) that there wouldn't be any London if the the US hadn't entered the war and Miss Trask corrects her (p. 53). They send postcards home. Mart writes to Di, Trixie writes to Dan and Honey writes to Brian. Only Honey's postcard is revealed to reader and she signs it "wish you were here" (p. 61). Honey is so trusting, yet Trixie is instantly suspicious of Gordie McDuff. This has tones of #15 The Mystery of the Mississippi where Honey's trusting nature got them into trouble. Trixie and the others are disturbed by the changes in Miss Trask's personality. She forgets the time (p. 90) and reprimands Trixie severely when they are forced to leave the Shakespeare Hotel after Trixie causes a disturbance with her laughter (p. 100-101). Miss Trask's name is revealed when McDuff calls her Marge and Honey tells them her sister writes letters to her, address to Margery (p. 115). Later she appears in a pink evening gown and they are all quite shocked (p. 130). Jim gets a classic line: "I think I'm in love - with a horse." (p. 149) Poor Trixie! However, his priorities are clear when he finds the group at the end and 'threw his arms around Trixie and whirled her until she was dizzy' (p. 207).